But the best part is what outside developers will be able to create for the phone. Well, there's a new iPhone. As everyone expected, Apple CEO Steve Jobs unveiled a new version of his much-adored phone at the company's Worldwide Developers Conference in San Francisco Monday morning. The new phone has 3G networking capabilities, allowing it to pull up Web pages and e-mail attachments more than twice as fast as the current model. It will also include GPS, so it can pinpoint your movements on a map and give you street-by-street driving directions. And the new iPhone will be much cheaper than the old model: The 8GB iPhone, which used to sell for $399, will go for $199. The 16GB model will sell for $299. So when can you get it? 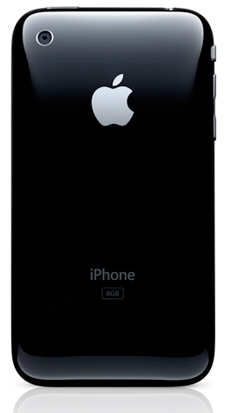 The 3G iPhone will be available in 22 countries starting on July 11, Jobs said. It'll go on sale in 48 more countries over the months to come. For all the anticipation surrounding the announcement, Jobs was surprisingly reticent about the new device. He gave no live demo and didn't show a close-up video of the new phone in his hand. All we got were pictures up on the screen. From there, the new phone looked much the same as the current model. The big difference is its back, which is made of shiny plastic rather than the shiny metal of the old model. The back curves slightly, bulging out in the center and tapering to an edge slightly thinner than that of the previous iPhone. Perhaps Jobs didn't pay spend much time on the exterior because what matters, here, is the inside. The new iPhone will finally be able run programs created by third-party developers (current models will get this capability as well). In the past year, I've criticized the iPhone for lacking this support; it's a mini-computer, but by locking developers out of the system, Apple was severely crippling its potential, I said. Finally, the company will fix this problem. In fact it'll do so in style: A parade of companies took the stage here to show off programs they've managed to create for the iPhone, and each declared the iPhone a pleasure to code on. These new programs created by outside companies -- including Sega, eBay and others -- were stunning. Sega's game Super Monkey Ball, which will sell for $9.99 on the iPhone's forthcoming built-in App Store, could become the phone's killer app, its own Super Mario Bros. You control the game by tilting the phone left and right, turning the whole phone into a joystick -- if it's just a fraction as fun to play as it is to watch, it'll be a smash. Pangea, longtime Mac game developers, showed off another game, Enigmo, a physics puzzler that uses lots of processing power to compute how objects bounce off each other. The game's developers said they found the iPhone's processor up to the computing task -- in fact, they called the iPhone version of the game the best version they've ever built. So, sure, there's a new iPhone. It looks quite nice, and the price sure is right. But the new hardware will matter less than what people all over the world are now building for it. If iPhone can beat Google, Nokia and Microsoft with developers, well, that'd be big.